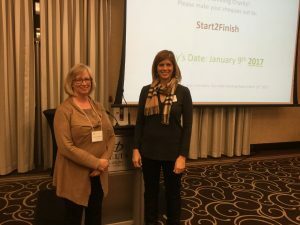 Start2Finish Guelph is Successful Recipient of our Meeting 10 Cheque! Meeting Two of Year Three! Three informative and inspiring presentations and one successful charity! 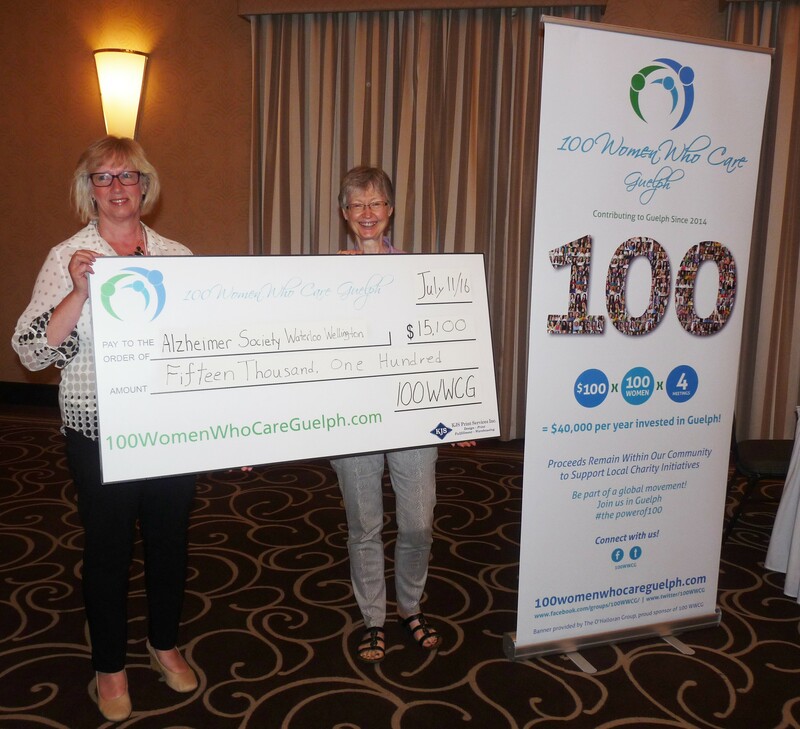 Our Tenth meeting of 100 Women Who Care Guelph reinforced the commitment of our 151 members, to giving generously to local community charities! We welcome our new members and thank everyone present for their thoughtful questions. Most important, we would like to thank all of you for your continued generosity! 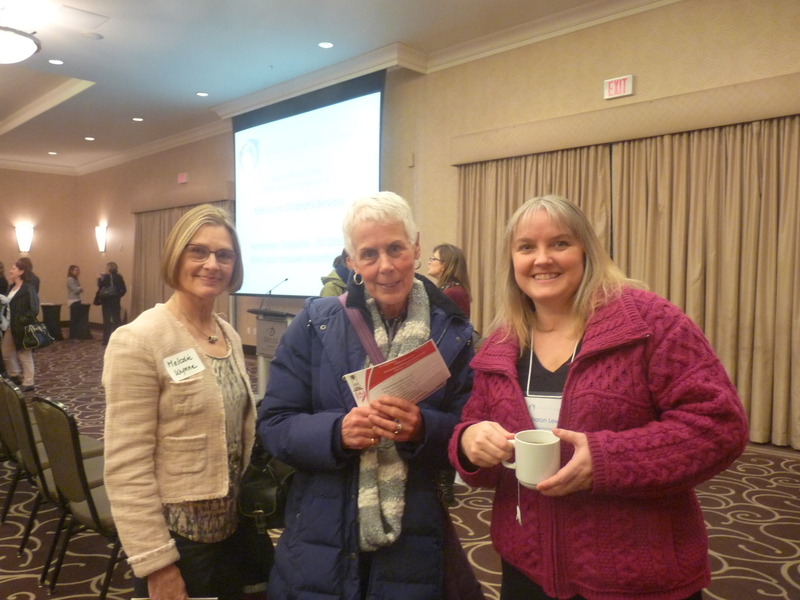 Wendy Clayson presented on behalf of Start2FinishGuelph. Start2Finish Running and Reading Clubs provide a supportive environment for children to accomplish academic and physical goals, as part of a 32 week program which culminates in the Start2Finish 5K Running & Reading Challenge, at the end of the school year. Irene Szabo presented on behalf of Trillium Waldorf School, an institution which provides a developmentally appropriate and experiential-based approach to education, to inspire life-long learning and enable children to fully develop their unique capacities. Diane Nelson congratulates Wendy Clayson, nominator of Start2Finish Guelph, the successful recipient of our Meeting 10 donation. After these thoughtful and informative presentations, the membership voted, and our selected charity was Start2Finish Guelph. When pledges come in from all members, our contributions will provide a substantial portion of the $20,000 start up costs for the new Westwood Public School running and reading program, including the purchase of books, running shoes, and t-shirts for up to 60 kids. We look forward to hearing about that impact at our next meeting on April 10th, 2017. You can read more about the program in Tannis’s press release by following this link. While we were waiting for the results of our voting, members had the pleasure of listening to a heartfelt presentation from Randy Betts, Head Parenting Coach, and a volunteer for the Guelph chapter of APSGO (Association of Parent Support Groups Ontario). 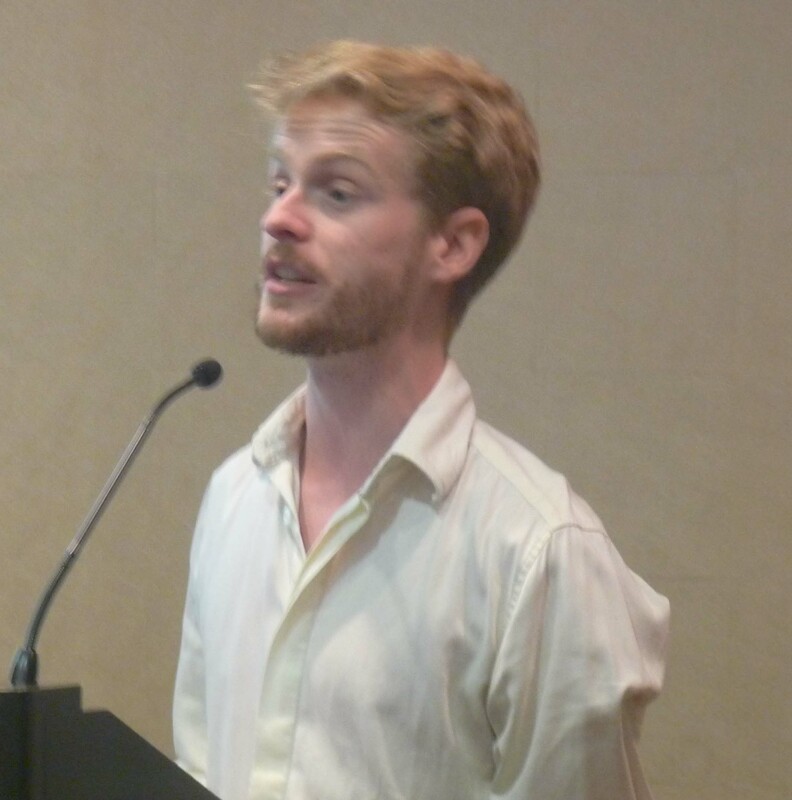 His talk was an inspiring description of the significant contribution APSGO has made to supporting the lives of parents and young people in crisis. Randy expressed gratitude for the contribution that 100WWCG made at their October meeting.After the meeting, many of those in attendance joined us for our after-meeting networking event sponsored by our very own members, Sandra Lastovic of The Mortgage Centre and Irene Szabo of Royal City Realty. This entry was posted in Notes on Meetings on January 11, 2017 by Miriam Vince. 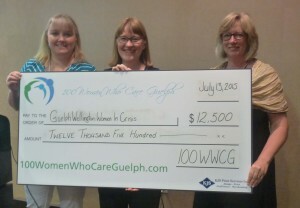 Our Ninth meeting of 100 Women Who Care Guelph kicked of 100WWCG’s third year! Our membership count now stands at 150 committed membership pledges. We welcome our new members and thank everyone present for their thoughtful questions and all of you for your continued generosity! Robin Smart presented on behalf of Victim Services Wellington, in support of their Project Lifesaver program, which provides wrist transmitters to families dealing with members suffering cognitive impairment due to a variety of conditions, including Alzheimer’s Disease, Autism, Down’s Syndrome and acquired brain injury. 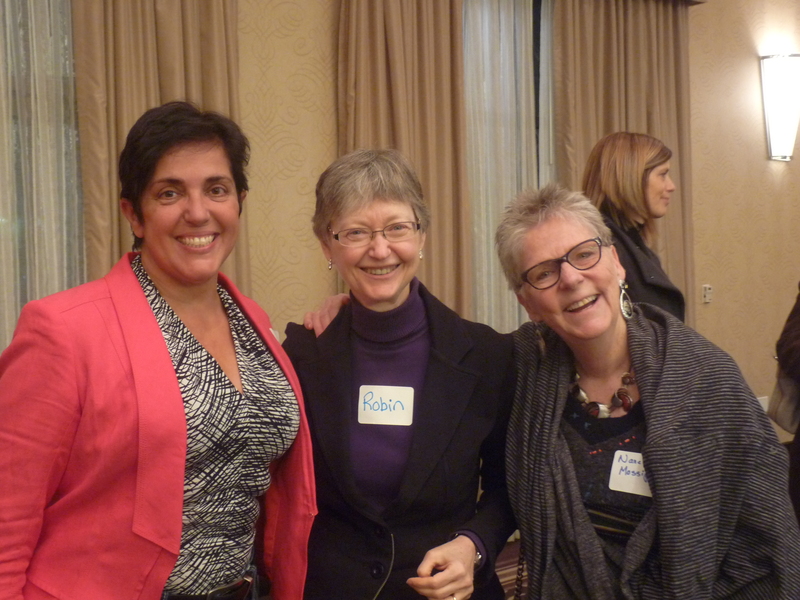 Rosemary Fernandez-Walker presented on behalf of the Guelph chapter of the Association of Parent Support Groups of Ontario. APSGO is an organization of parents of disruptive youth who have joined together to provide support and empower parents to deal with their situation. The organization provides weekly meetings, workshops and other resources to assist parents in acquiring the skills to help themselves and their children. 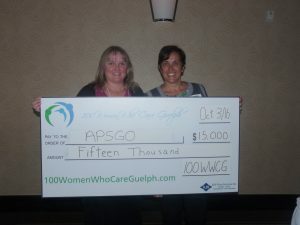 After these fascinating and inspiring presentations, a vote was taken, and our selected charity was Association of Parent Support Groups of Ontario ( APSGO) When pledges come in from all members we will be contributing $15,000 to fund a conference in Guelph. We look forward to hearing about that impact at our next meeting on January 9th, 2017. You can read more about the program in Tannis’s press release online. We had the pleasure of listening to an inspiring presentation from Michelle Martin, executive director of Alzheimer Society Waterloo Wellington and Thayna Walker, program co-ordinator. They gave us a moving description of how our July 2016 donation to their Minds in Motion program has improved the lives of people with dementia and their care partners. Our $15,100 donation has really made a difference and changed some lives! Post-meeting networking is a great way to connect! 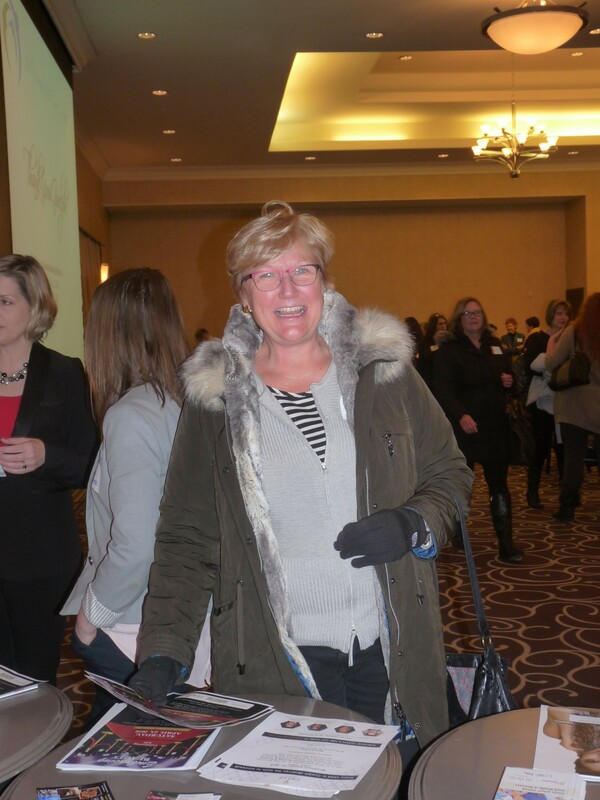 After the event, many of those in attendance joined us for our after-meeting networking event sponsored by our very own members Sandra Lastovic of The Mortgage Centre and Irene Szabo of Royal City Realty. This entry was posted in Notes on Meetings on October 5, 2016 by Miriam Vince. 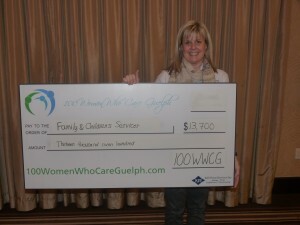 Our 8th meeting of 100 Women Who Care Guelph raised the bar on donations higher than ever before! Barb McPhee, manager of the North End Harvest Market and Harvey, the Market’s mascot. Thank you to all of the women who joined us on the evening of July 11, 2016. 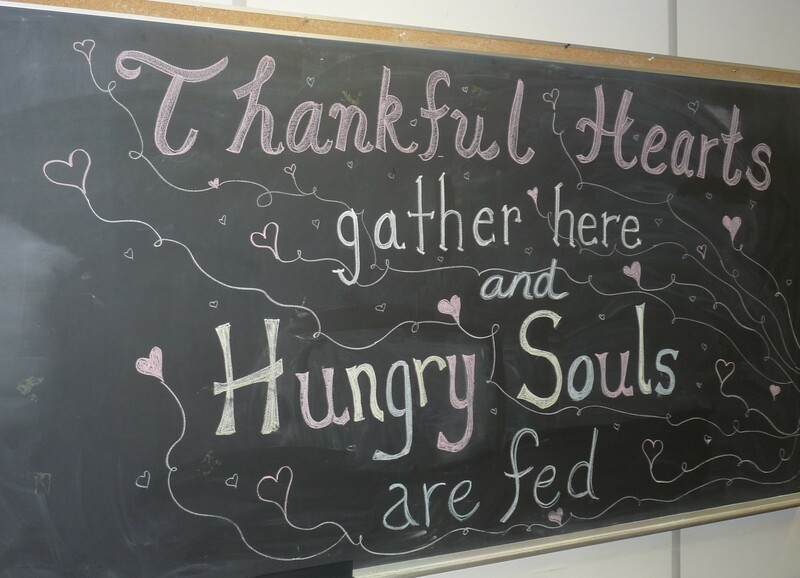 We had the pleasure of listening to an inspiring presentation from Barb McPhee, manager of the North End Harvest Market regarding the impact of our April 2016 donation to the Guelph Neighbourhood Support Coalition, in support of the market. 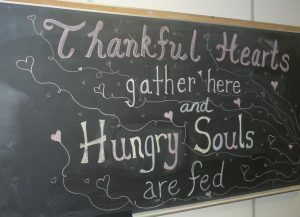 Our $14,600 donation has really made a difference to their day to day operation and changed some lives! 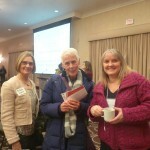 Robin Smart presented on behalf of Alzheimer Society Waterloo Wellington, in support of their Minds in Motion program, which incorporates physical activity and mental stimulation for people with early to mid-stage signs of Alzheimer’s disease or other dementias and their care partners. Paula Alblas presented on behalf of Civil K9 Youth Services, a non-profit charitable organization focusing on the use of service dog training as a means to mentor youth, specifically boys aged 12-18 years old. 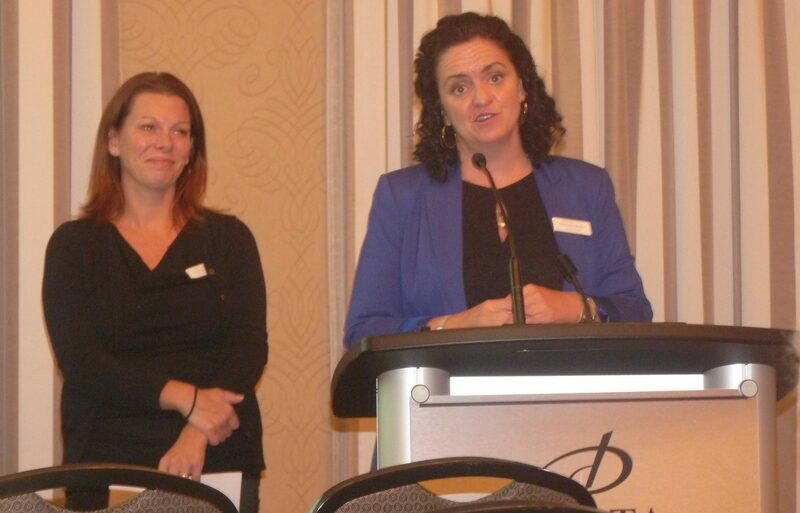 Karen Bilton presented on behalf of Victim Services Wellington and their program which provides support to victims of crime, accident or loss, 24 hours a day, 7 days a week, year round. 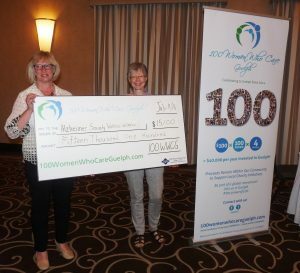 As we listened to Barb McPhee’s presentation, votes were tallied and our selected charity was the Alzheimer Society Waterloo Wellington. When pledges come in from all members we will be contributing $15,100 to their Minds in Motion program. We look forward to hearing about that impact at our next meeting on October 3, 2016. 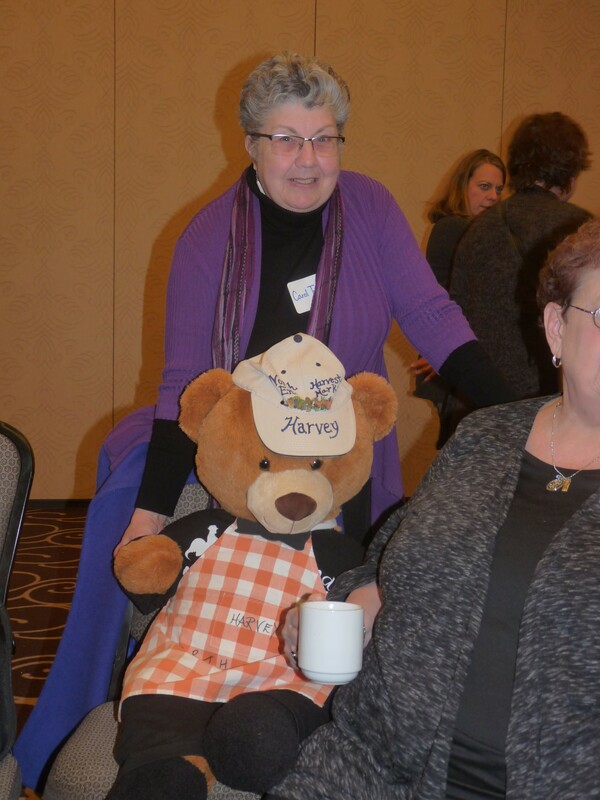 Here’s a photo of your combined donation and our nominating member. 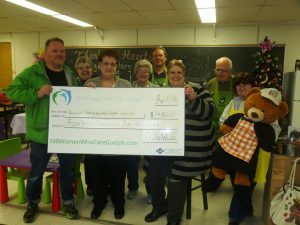 Diane presents a cheque to Robin Smart, the nominator of Alzheimer Society Waterloo Wellington. This entry was posted in Notes on Meetings on July 12, 2016 by Miriam Vince. 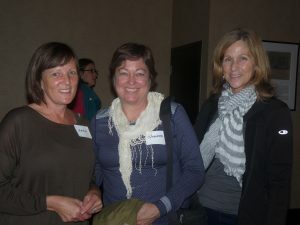 Our 6th meeting of 100 Women Who Care Guelph was another incredible success! Thank you to all of the women who joined us last evening to hear from the Dunara Homes for Recovery. Yvonne Bowes from Dunara let us know about the impact of our donation in a funny, and engaging talk. You can find a transcript of Yvonne’s talk on our website here! 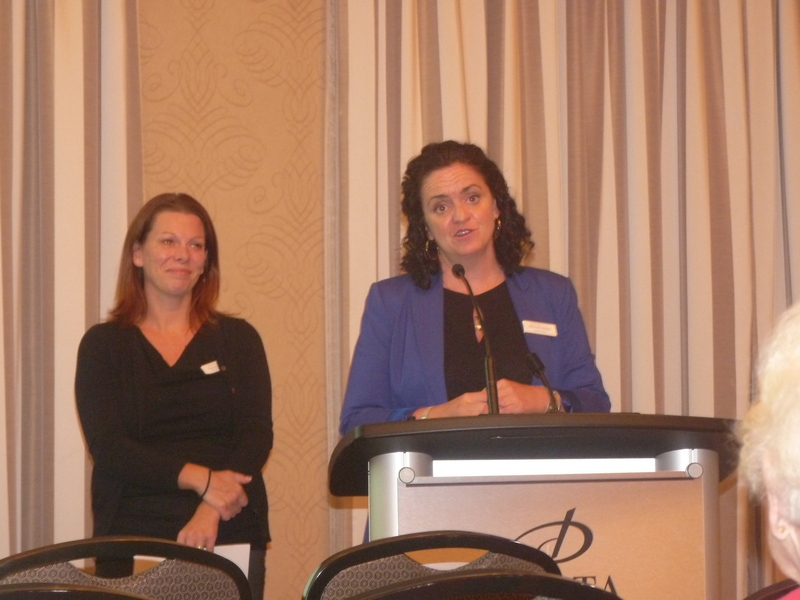 Following the presentation from Dunara, we again selected three of the nominated charities at random (Family & Children’s Services, Special Olympics Ontario and Community of Hearts) and heard from our three nominating members as to what our support for that charity could contribute to the community. 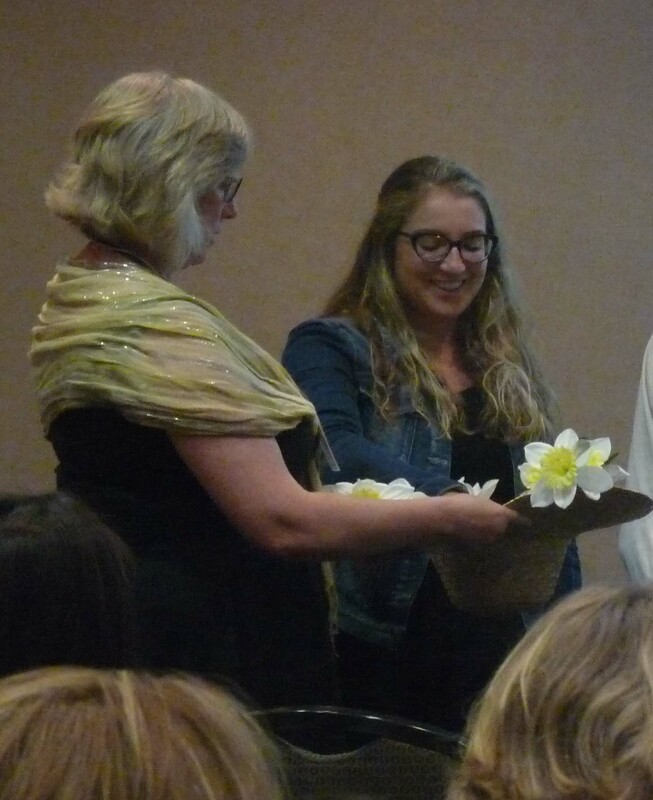 All three charity presentations were well thought out and wonderfully presented. A hard choice it was, but a hard choice we made! With much enthusiasm we tallied the votes and selected this month’s recipient! We have selected Family and Children’s Services to receive this meeting’s quarterly donation! Specifically a pilot fund to assist young adults make the transition from supported living in foster care or other teen programs to independent living. 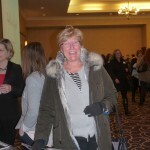 Here’s a photo of your combined donation and our nominating member Laura Greenway-Balnar. Congratulations to Family and Children’s Services! 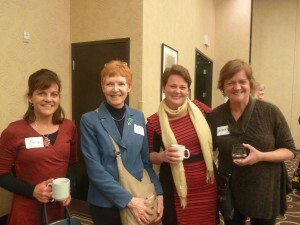 Great women getting to know each other! Terrie and Sandra are flanked by new members Wendy and Brenda! Welcome Ladies. As if these meetings could possibly get any more fun. Well, apparently they did. Here are some of the goings-on. We hope you can stay after the next meeting so you can be showcased having a great time making a difference. Wait? 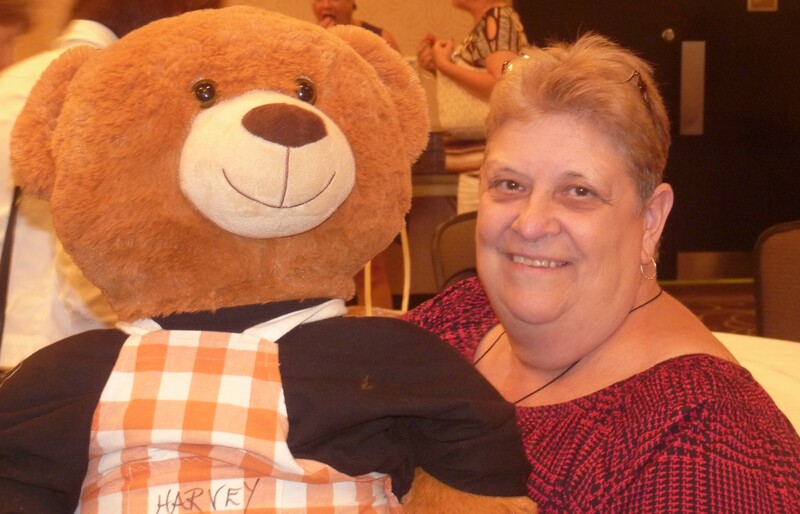 Who’s Harvey and did he leave a cheque? Obviously, a good time was had by all! What would it take to have fundraising be this easy every month? We have cracked the code. Come on in and enjoy yourselves! Tell your friends. 100WWCG has it going ON! There was lots of action at our new “Materials Table” as well. At the next meeting, if you’ve got some information about a fun or important local charity or business event we now have a place for you to share that information. See? Someone just discovered a cool event! Where to find out about local charity initiatives. This entry was posted in Notes on Meetings on January 18, 2016 by slewis. We can’t believe it’s year two already! 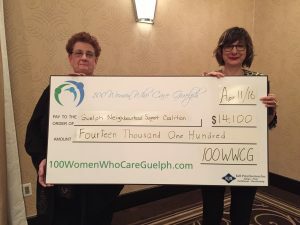 After extending a warm welcome back to our members, a reminder of the $46,600 we contributed to Guelph last year, and a brief update on procedures, we launched right into picking our three charities up for contention. 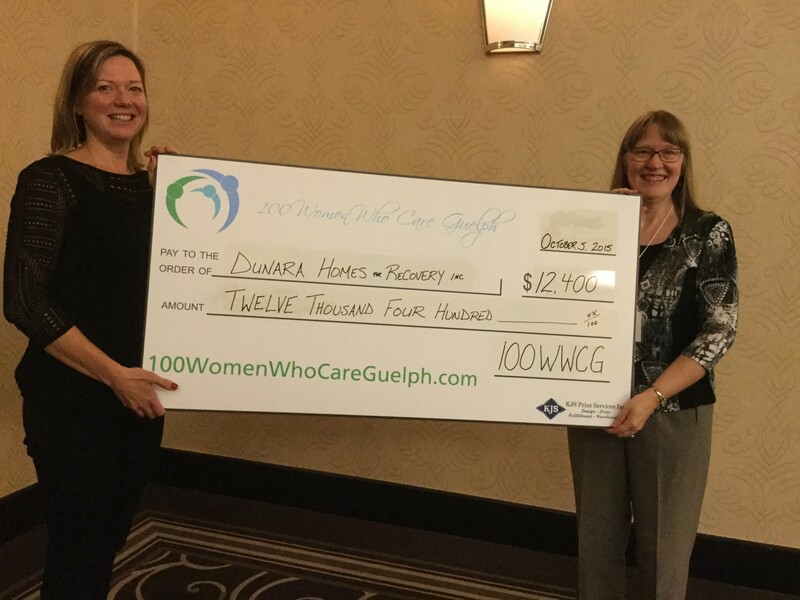 We heard three very passionate speeches on behalf of the Alzheimer Society of Waterloo Wellington, The Children’s Foundation of Guelph Wellington, and our eventual winner (drum roll please) Dunara Homes For Recovery Inc., who received approximately $12,400 to aid their cause. Dunara Homes for Recovery, our 5th winner! Michele Mactaggart (left), proud presenter on behalf of Dunara Homes, and Tannis Sprott of 100 WWCG (right) celebrate our newest winner. Many of our members were unfamiliar with Dunara Homes for Recovery. They have been quietly working away in our community since 1981, helping those suffering from mental illness as they transition from an institutional setting to a community setting, providing all the support they need on their road to recovery. They work towards autonomy, individual responsibility, engagement in the community, empowerment, hope, self determination, the elimination of stigma, and the opportunity for meaningful choice for their clients. 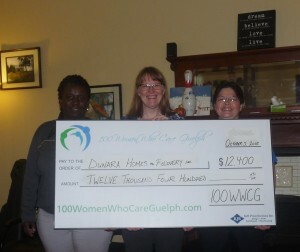 Our latest gift to Dunara Homes for Recovery was graciously accepted by Executive Director Yvonne Bowes (on right) and Yoland Webster, their Program Manager (on left), presented by 100 WWCG Organizing Member Tannis Sprott (centre). We were delighted to hear back from Sly Castaldi from Guelph-Wellington Women in Crisis, our winner from July. 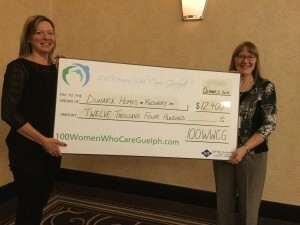 She was able to draw a parallel between the beginnings of GWWIC and 100 WWCG (other than the obvious alphabet soup of Gs, Ws and Cs), saying you never know when you start something how important and far reaching it can become, and she applauded 100 Women Who Care Guelph for making an incredible difference to all the charities here in Guelph. We hope to have her comments posted here shortly so those of you who missed her wonderful thank you will have a chance to hear it, so check back soon! You have until January 4th to get your charity nominations in before our next meeting on Monday, January 11th, 2016, from 7 – 8 pm (registration begins at 6:30) at the Delta Guelph Hotel and Conference Centre, where we will choose our next member nominated charity! Help us to grow by inviting your friends to join you in this amazing venture. See you there! This entry was posted in Notes on Meetings on October 7, 2015 by Tannis Sprott. 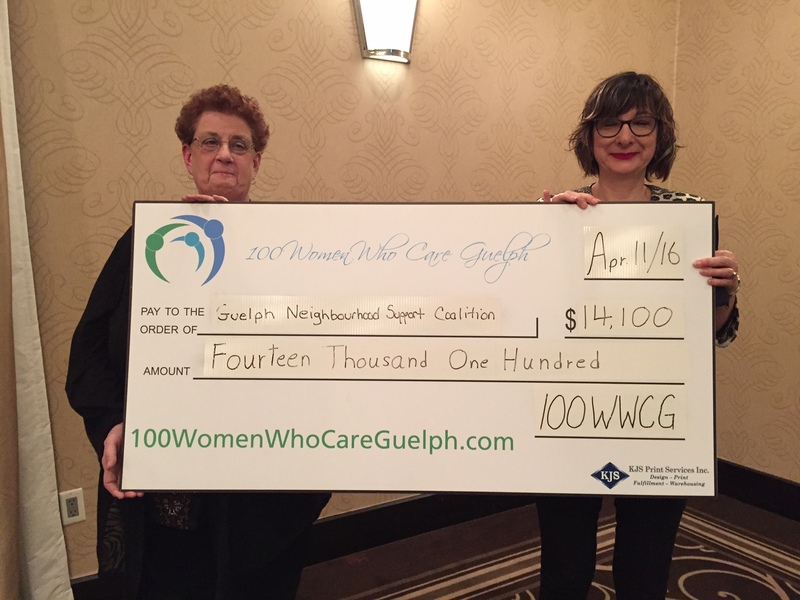 100 Women Who Care Guelph concluded it’s first year of operation with the fourth meeting of the season. 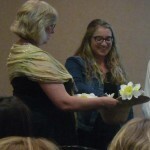 Giulianna Giancotta from Rainbow Day Camp selects this month’s nominees with Diane Nelson. We opened with some updates and then heard a heartfelt description of the results of last meeting’s donation to Rainbow Day Camp from the passionate and committed David Jackson – Teen Camp leader. We’re reaching out to David to get the text of his speech if we can. Stay tuned for that. 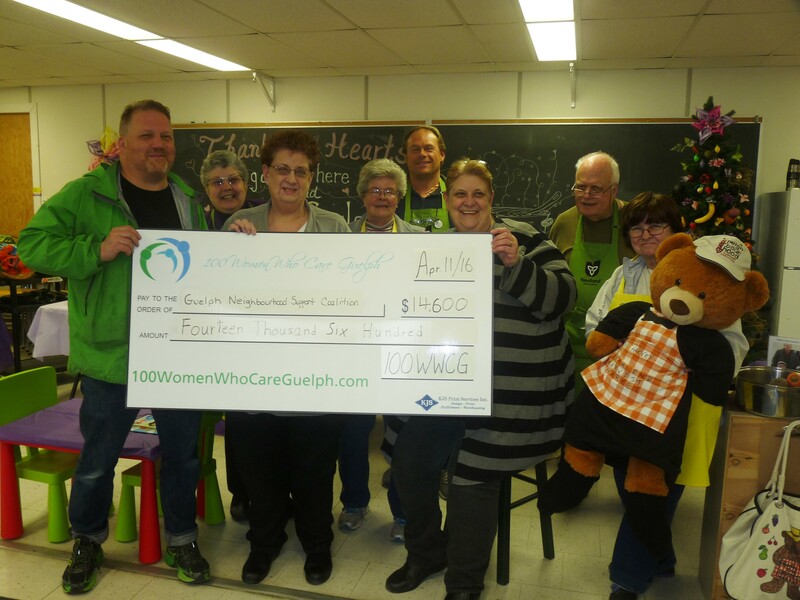 fourth charity selection meeting to receive an award of approximately $12,500 from the membership of 100 Women Who Care Guelph. The Transitional Housing and Support program provides counselling and levels of services so desperately needed by women and their children who are experiencing or have experienced abuse, helping them to start over, with both practical and emotional support. Many of our current members joined us for this impromptu group shot – we hope you can join us next meeting! Keep your eyes and ears open for other worthy charities, and get those nominations in by the deadline of September 29th for our next meeting set for Monday, October 5th, 2015, from 7 – 8 pm (registration begins at 6:30) at the Delta Guelph Hotel and Conference Centre, where we will choose our next member nominated charity! See you there! We celebrate all the members of 100 Women Who Care Guelph who have made such an amazing difference this year. Together we’ve raised $46,600 for area causes. And we’ve only just begun! This entry was posted in Notes on Meetings on July 14, 2015 by slewis. 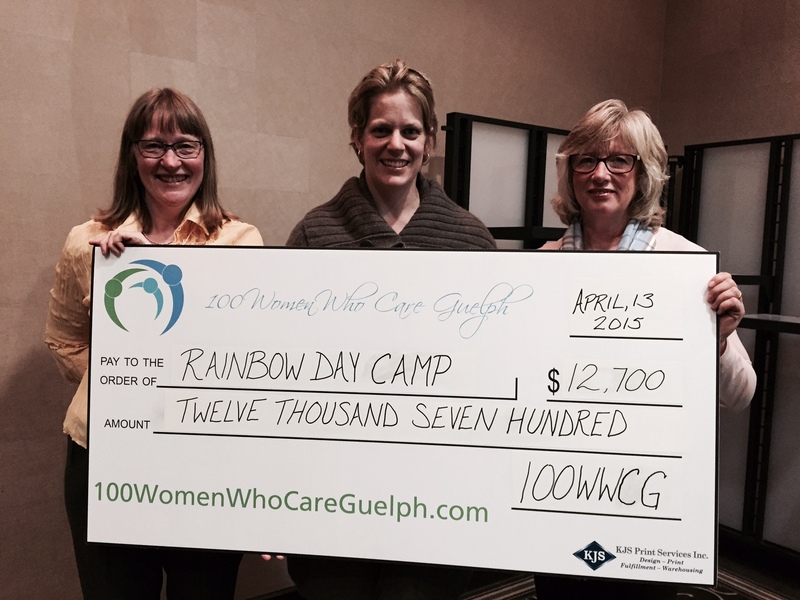 Congratulations to Rainbow Day Camp, our most recent winning charity! Collectively we have pledged $12,700 to this worthy organization. 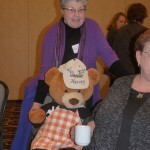 Start thinking of other worthy charities, and get those nominations in by the deadline of July 6th for our next meeting set for Monday, July 13, 2015, from 7 – 8 pm (registration begins at 6:30) at the Delta Guelph Hotel and Conference Centre, where we will choose our next member nominated charity! See you there! If you are looking for a charity to champion, click here for a partial list of registered charities in Guelph, and then fill out a Charity Nomination Form. Remember, it must be a registered charity, and the funds must remain in Guelph. Let’s put our passion to work for our friends, neighbours and community! This entry was posted in Notes on Meetings on April 14, 2015 by slewis.